Tired of trying to find nutrition information on sites where you aren’t quite sure of their accuracy? 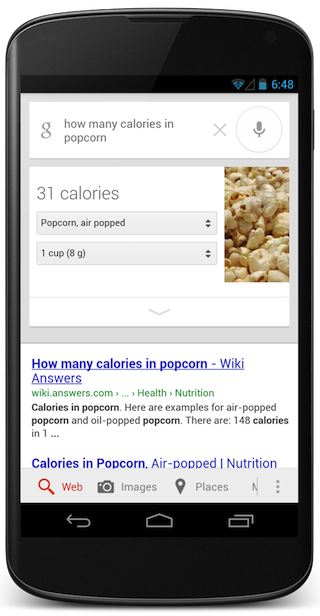 Google has launched a new nutrition search that provides accurate and up to date information on a wide variety of food and drinks. The nutrition info search goes far beyond just letting you know how many calories are in that banana. You can also query Google for other nutrition information such as how much protein, carbs, sodium and other nutritional values are in the product as well. It also allows you to tailor your searches, such as with apples you can specify the size, with popcorn you can specify how it was popped or by serving sizes or cup size. Google currently has over 1,000 fruits, vegetables, meats, and meals included in their nutrition info search, and they plan to add more features, foods and languages in the future. It is currently available in English and will be rolled out throughout the U.S. within the next 10 days.